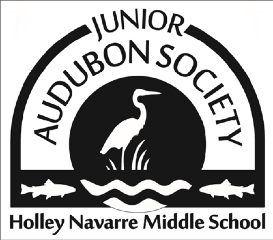 Holley Navarre Middle School (HNMS) has just launched its Jr. Audubon Society Club. This club is designed to get families together participating in environmental activities. Our goal is to foster environmental awareness and science literacy through monitoring and observing habitats the students have only learned about in textbooks. Students will be involved in the “Citizen Science” program as they will document and post data collected throughout the year from the various field trips in which they participate. In addition, students will meet and interact with professionals from various environmental organizations as the students will be participating and providing activities and information at community events. To date, we have over 75 registered students in the Jr. Audubon Society. These students are interested, motivated, and energetic! Since we started the club in October, students have developed a webpage, newsletter, and logo for the club. In November, we had a field trip to Project Greenshores where students were identified and recorded flora and fauna. We also had a camping trip to Big Lagoon State Park where students met and worked with park rangers and Americorp Volunteers to help remove invasive species from the park. While at the park, students were also able to sample the brackish waters, paddleboard, kayak, and attend a Night Sky presentation by Dewey Barker of the Escambia County Amateur Astronomers Association. Coming up this month, the students will be introduced to aquatic biology as they sample Pond Creek in Milton, Florida with Frank Butera of The Department of Environmental Protection. Meanwhile, on the campus of HNMS, the students are also holding a collections drive for materials to be donated to the Wildlife Sanctuary of Northwest Florida to be delivered during a February field trip. In terms of outreach, we feel it is of utmost importance to have our members become actively involved in sharing information with others. Therefore, members of the Jr. Audubon Society are also scheduled to participate in the Seagrass Awareness Festival held in Gulf Breeze, the Spring Baby Shower at the Wildlife Sanctuary of Northwest Florida, a beach clean-up in Navarre on Earth Day, and Autism Odyssea event held at the Navarre Beach Marine Science Station. Plans are in the works for Junior Audubon Society members to work with FMWAS members future projects to enhance local bird and insect habitat, as well host presentations by shorebird stewards who will inform and instruct interested members how to become involved throughout the spring and summer. Please visit the Jr. Audubon Society Club link below.